Vacation rental travelers are in it for the long haul. The nearly 90 percent who plan on hitting the road this summer will spend an average of 12.3 hours driving to their vacation destination. These are among the findings of a recent study* of more than 11,000 vacation rental travelers conducted by Wyndham Vacation Rentals, the world’s largest professional manager of vacation rental properties and part of the Wyndham Worldwide family of brands (NYSE: WYN). As might be expected, the study also found that men tend to take the wheel on road trips. However, the actual disparity between genders is steep. Nearly four in five men (79%) say they drive on a road trip compared to just one in five women (23%). Perhaps more surprising, women are the more aggressive road trippers. They’re more likely to describe their driving style as “Pedal to the Metal” (49% vs. 41%) while men are more willing to take the “Long & Leisurely” route (29% vs. 21%). Other findings show that food plays an important part in the road trip. • They try to snack healthy in the car. When picking their favorite road trip snack or beverage, only 4% of vacation rental travelers cite fast food as their top choice. 26% prefer healthier options like nuts, seeds and trail mix. • Where you live might affect your choice. Vacation rental travelers from the Pittsburgh, PA metro area have the biggest sweet tooth, while those near Cleveland-Akron, Ohio are more likely to crave something salty. Tampa-St. Pete, Florida and Denver, Colorado tie for the most health-minded vacation rental travelers, while those from Los Angeles, CA are most likely to be found in the drive-thru. Part of the fun is getting there. • Bad driving is their biggest complaint. Nearly half (49%) of vacation rental travelers agree that bad driving is far and away the most annoying road trip occurrence. 22% rank backseat driving their second biggest annoyance. • Men and women clash on car-ride fun. Men are less appreciative of aspiring singers with 35% finding singing or humming moderately to extremely annoying compared to just 25% of women. Women are more likely to roll their eyes at steering wheel drumming with 26% finding it very to extremely annoying (compared to 18% of men). Start planning your own road and vacation rental experience in celebration of upcoming National Vacation Rental Month in July. 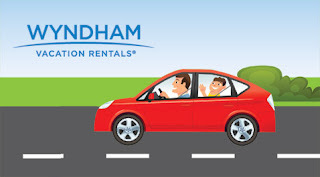 Visit WyndhamVacationRentals.com for vacation deals in popular destinations like Delaware’s Beaches, Northwest Florida, Gulf Coast Alabama and the Tennessee Smoky Mountains. *This study was conducted through an online survey of Wyndham Vacation Rentals’ database from April 6, 2015 – May 3, 2015.